The Gnoss Field Community Association is pleased to announce ‘Wings Over Marin’, a day full of fun, flying and friends at Gnoss Field.The event is for all of Marin to enjoy. The theme is ‘Women In Aviation’ with emphasis on different ways that women interact with aviation. There will be two speakers, (astronaut and FedEx pilot) and a seminar with 4 women in very different roles of aviation. During the day there will be free plane rides for kids, displays of planes young and old and lots of exhibits. As our commitment to the youth of Marin GFCA is giving away two scholarships to youth, $1250 each, who aspire to a career in aviation. We need help in distributing the information about the scholarships. 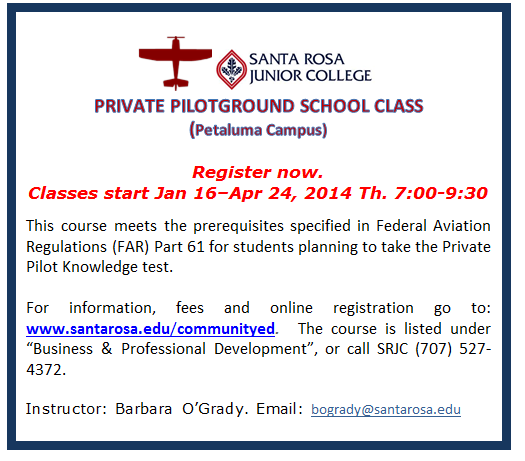 Many thanks for helping to promote youth in aviation! When I first got reeled into helping with Wings Over Marin (WOM) I thought it was just for planning and ideas. Well now that the theme is Women in Aviation I’ve jumped in with all feet and have lists of things to do. We will have two keynote speakers and a panel of speakers for a seminar. The wealth and depth of aviation that women are involved is exciting. We will have two commercial pilots on the panel, an ATC, aviation attorney (Kristin Winter), and the director of Oakland Airport. Because Gnoss Field has no parking they will be busing people from the Fireman’s Fund parking lot on the west side of the freeway. There will be 6 buses and we need a docent on each bus to explain to the visitors some of the basics and also what’s in store for them on the field. (speakers, seminar and fly bys, raffles.) I need 5 of us to be docents. Can you help? It will be a short job. Starting at 9:30 until maybe 11:00. Thanks so much for volunteering. There will also be 5 kid flights being raffled off. They would really like to have women flying the kids. It would only be a ½ hour local flight. You could totally make a kid’s day! Give me a call if you and a plane are available. As we get closer I’ll be sending out schedules of the event. Let’s put our best smile forward! I’m casting out for a good date to get together for a summer party. You’ll hear soon! Lots to celebrate! From Sand Point Don and I kept to the odd flight levels and turned our prop towards Montana. You wind your way through dense ridge lines of the Continental Divide following rivers and passes much like the early explorers. How they ever managed to pierce this huge wall of terrain was an amazing feat. The scenery is so inspiring the crossing goes by quickly. Soaring east you quickly swap cloud piercing peaks for the descending plains of the ‘Big Hole’ country. These lands and water are the headwaters of the Missouri River. The Gallatin, Madison and Jefferson Rivers drain the lands of Yellowstone creating the link of waterways from the Gulf of Mexico to the Pacific Northwest. The magnitude of our continent is so impressive from the 12,000′ flight level. We made an overnight stop in Great Falls, MT.. When I read Lewis and Clarks expedition notes they were utterly blown away by the falls of the Missouri. They thought it was a huge fire/smoke from afar. I wanted to experience the sting and spray of water from its edge. Alas the Army Corp of Engineers got there first and brought the mighty river to heel. Sadly five dams have tamed the once magnificent falls of the Missouri River. What compensates for the lack of drama is a well done interpretive center detailing L&C’s entire route into the western wilderness. Also in town is a museum dedicated to Charlie Russell, one of the early artists of the west. When you park at Great Falls airport be sure to stay at the Front Range FBO; Super nice people, courtesy car and good gas prices. There is also the added entertainment of the Montana Air National Guard and their F18s screaming across the skies. Onto Bozeman we followed the trail of Lewis and Clark, winding our way up the Missouri River and its tributaries. You can’t help but ask, did the wonder, the amazement, the joy of scenery never before witnessed ease the burden of hauling canoes up river? Did they sink to their knees in the mud as the ropes bit into shoulder sinew? Did the mosquitoes attack with the same vengeance? Did the awe of the evening light slipping from mountain peaks soften the cost of the unknown? Truly what undaunted courage! The Missouri River is one of the few waterways that flow north from their headwaters. When we were flying over Three Forks, Mt, where the Madison, Jefferson and Gallatin rivers converge to form the Missouri, I felt the thrill that explorers must have celebrated. Where rivers begin, knowledge flows. Bozeman, MT has to be the most liberal town of Montana. Anywhere ranching is king you know there is a conservative bent in the politics. Yet Bozeman is blessed with a university, lively art and music venues, close to Yellowstone and Glacier National Parks and adventure capitol of Montana. Best of all was a congregation of women pilots from all over the world. How cool to sit and talk with a young 83 year old who is still flying. The spirit of these conventions is so “can do!” We enjoyed some really interesting speakers, cheered on 36 Amelia Earhart Scholarship winners, honored Kitty Houghton with the Award of Inspiration and bathed in the light of women who make the most of life. During the business meeting I was corrected on my interpretation of the amendment I wrote to you about earlier. (Having to back pay dues if you want to be reinstated) What this amendment was referring to was if you wanted your ‘original’ initiation date on record, ( instead of when you rejoin after a lapse in membership); you would pay for the past years away. OR If you want to rejoin there is no penalty of arrears payment to restart your membership with a new start day. The rationale for this is that it’s important for some people to say they’ve been members for 20, 30,40 years or more. Amend 2: Failed: Associate members being allowed to vote. Amendments need a 2/3 majority to pass. There were enough people voting who thought voting privileges should only go to licensed pilots, (not student pilots). I don’t agree with this. Our future Life blood of the organization are these women. We need to understand their concerns. July: 2014 99’s International meeting- New Orleans!!! We then had an hour of reports of all the committees which you can also access online. Besides all the fun of flying and gathering with friends, the meeting once again restores my commitment to our organization and our goals of promoting women in aviation. It really is an inspiration! After 4 days in Montana it was time to find home. I had left CA back in April and felt the pull of the hearth. Lift off was crisp, early Sunday morning, as I climbed to 12.5 to navigate the Continental Divide once again. The fun of mountain flying isn’t just the sights but the navigation around peak and cloud, the flurry of virga on your wing, the “where are we?” and all the WOW factors. Five hours and 17 minutes later, multiple mountain ranges, geography changes, wx systems, vast plains and the wealth of the west we were home again. What a joy to call this gorgeous piece of the west home! This concert commemorates Singers Marin’s 25 years of fulfilling its mission, “touching hearts…uplifiting spirits,” through providing choral music excellence to the community under the leadership of Artistic Director and Founder, Jan Pedersen Schiff. Because of what Singers Marin has accomplished under her direction, Jan will be inducted into the Marin Women’s Hall of Fame the week prior to this exciting celebration concert. We will present this concert in memory of Catherine “Kitty” Houghton, a beloved member and huge supporter of Singers Marin. The moment has come… I’m now one of those aging pilots who find something else to do instead of fly. Gone is the enthusiasm to jump in the plane and go no where. Winter came and went, lots of days of clear, brilliant sunshine. Days flow downstream without a lift off or touch down. The plane remained tucked away in the hanger for it’s long winter nap. What a pity party! I managed to remain current with the basics. Yet there was no great adventure to write about. This lethargy had to stop. We rediscovered some fun flights that didn’t cost days or a bundle of money. ANGWIN, which is just a 20 minute flight away has some of the best hiking minutes from touch down. The Sonoma and Napa valleys were carpeted in luxurious mustard while vineyards remain skeletal prior to bud break. On Saturdays Angwin is a ghost town. It’s their sabbath day so no traffic in the pattern. The airport environment is great for special effects. Downwind feels like the airport is at your altitude, short final has some very tall trees and a really long displaced threshold. Runways like these shake out the cobwebs and remind me why I love to fly. On the east side of the airport follow the trails beyond the hangers where the trail drops down into a valley and miles of single and double track. Head easterly and you’ll end up at a rocky promontory overlooking the Pope Valley. It’s one of the prettiest views of our CA coastal range. Take a picnic and lap up the sunshine. MONTEREY has another great secret. Call ahead to the Monterey Jet Center and let them know you’re coming and would like to reserve a car. They loan out crew cars for free. By having them top off your tanks it’s a nice reciprocal of their generosity. The Jet Center is at the west end of the airport. You park, pick up a warm, just baked cookie, hop in the car and off you go. Our destination was Garland Park in Carmel Valley. Drive east from the airport then head over Laureles Grade to Carmel Valley. Garland Park has trails that climb up and out of the valley into some of the most beautiful native wild flowers, oak forests and redwoods. Hours of great hiking to enjoy! For something more urban you can always stroll the cliffs of Monterey or Pacific Grove and the aquarium. Or for a wilder aquatic experience drive north to Moss Landing and rent a kayak to explore Elk Horn Slough. You’ll be surrounded by sea otters and seals in languid waters. The Jet Center lets you keep the cars until 9:00. Lots of time to play and then a coastal sunset flight home. So no more whining, dusty, aging pilots. Flying is our E ticket to joy and fun. Don’t let life get in the way of your flight time!